Link Investigations was established in 1995 by experienced personnel and since then has been working for legal clients, companies, organisations and individuals throughout the UK and overseas. Tracing family members and friends you have lost touch with. Pre employment checks, CV validation. Matrimonial, partner and domestic matters. If you think you may require the services of an experienced Private Investigator, Researcher, Genealogist, Countermeasures expert or Computer Security Consultant, contact us today for an informal chat in complete confidence. 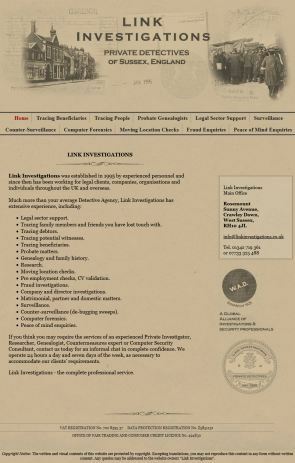 Link Investigations - the complete professional service. Although based in South East England Link Investigations work regularly covers the whole of the UK. Our tracing service is worldwide.